With so many options of things to do, how do you ever decide where to spend Valentines Day in Puerto Vallarta? So, I thought I’d help out all the boys out here with some great ideas your ladies will love. Pssst….Bonito Kitchen is technically a locals secret, so I might get in a little trouble for sharing this with you…but, THIS is where you want to be on Valentines day if you’re hip, chic, & into a casual but cozy night of being served exquisit Asian Fusion inspired bowl of wonton soup, dessert & a glass of champagne with your lover for only $199 pesos. You and your love can experience an authentic modern-Mexican architecture photography tour in Historical Old Town Puerto Vallarta! The cobble stone streets offer the unique essence of true Mexico, featuring vibrant colors, contrasting textures & exotic art displays that line the paths throughout the vastly decorated neighborhoods. The colorful traditional Mexican facades offer a gorgeous backdrop of your romantic photos, while the mosaic park, a local favorite, features an enchanting ambiance of bright color, culture & the booming energy of the famous Romantic Zone. This is a 40 min art & architecture photography tour with your special one. Your HD digital prints will be delivered within 10 days of your experience! 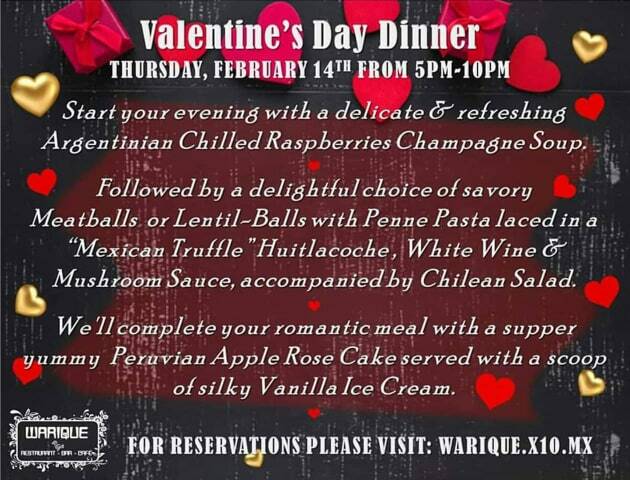 Reserve Your Spot Before Valentines Day! With their exclusive location on Playa Caballo just south of Puerto Vallarta, this adults-only boutique hotel offers luxury accommodations in chic yet traditional beach & jungle villas. The hotel features a must-do spa experience, delicious cuisine & a cocktail beach bar. This exciting night cruise offers a packed evening of music, history, magic & fun on one of Vallarta Adventures Catamarans. The cruise will take you on a tour along the scenic route of Puerto Vallarta’s Malecon, on your way to the intimate destination of Las Caletas Beach. There you will be dazzled with a candle lit dinner, exciting shows & enticing entertainment. Warique is inspired by the everyday family cooking style. Feel at home while savoring the great delicacies in their comfortable dining room, bar, and relaxed outdoor patio or balcony, with a rustic ambiance design. This romantic destination is perfect for you and your loved one. La Palapa Restaurant combines gourmet cuisine, friendly service, and the tropical setting of Los Muertos Beach in Puerto Vallarta, México. They offer a wonderfully romantic ambiance & ocean views, & is the perfect location to spend the romantic holiday with your love. El Dorado, the sister restaurant of the famous La Palapa, offers modern Mexican cuisine, a delightful ambiance & ocean views located in the always buzzing romantic zone of Puerto Vallarta. This romantic & elegant restaurant is located in the heart of Punta de Mita, and will be featuring an exquisite menu offered by world renowned chef Thierry Blouet, who creates his dishes with inspiration from flavors of the sea. This casual but chic coastal style atmosphere is a perfect way to spend the romantic holiday with your loved one. Puerto Vallarta's upcoming events, festivals, fiestas & things to do in Fall of 2018. Here’s a small part of what we do here in Puerto Vallarta to rescue local animals. Older PostHiking Monkey Mountain in Sayulita - Full Video!